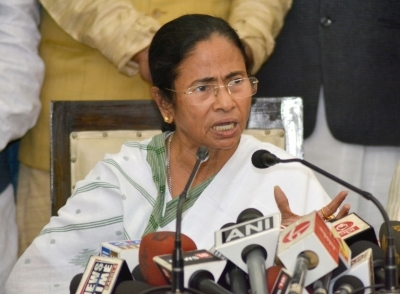 Kolkata, Feb 12 (IANS) West Bengal Chief Minister Mamata Banerjee on Tuesday condemned the BJP government in Uttar Pradesh for preventing Samajwadi Party chief Akhilesh Yadav from taking a flight to attend an event in Allahabad University. "I've already spoken to yadavakhilesh. We all condemn the arrogant attitude of the so-called BJP 'leaders' who didn't allow Akhilesh to address the students," Banerjee tweeted. "Even @jigneshmevani80 was not allowed. Where is the democracy in our country? And they are giving lessons to everybody!" A fuming Yadav, a former Uttar Pradesh Chief Minister, who returned home after arguing with the airport officials for about two hours, said the state government was so scared of him that they stopped him from going to Allahabad University.